Stay connected no matter what moment youвЂ™re in. always making the most of each day. maximize media playback and web browsing. > My Device > Tips & Tricks. help and more at www.motorola.com/mycliq2. To save battery life, see вЂњBattery tipsвЂќ on page 27.
secure, and should only take a few minutes. Tip: Open your phone to type. to вЂњAdd accountsвЂќ on page 12.
you can communicate anyway you like. in вЂњSecurityвЂќ on page 49.
more in вЂњWi-FiВ® networksвЂќ on page 39.
file transferвЂќ on page 42. Touch & hold to move. or the phone (Power off). again, or open the phone. use вЂњScreen lockвЂќ on page 49.
hold to move or delete. Add to Home screen menu. searches the web and your apps. вЂњUpdate your statusвЂќ on page 12.
touchscreen keypad), then type to search. then touch Use as phone ringtone. side of your phone) is turned off. launch and choose a key. and B to launch the browser. left corner, and you can remove the app. downloaded are listed and available for download. see вЂњWi-FiВ® networksвЂќ on page 39. You can set up вЂњWi-Fi callingвЂќ on page 40.
вЂњGPS & AGPSвЂќ on page 58.
other options, touch and hold the contact. Status (list with status) at the bottom. choose Hide in Contacts list or Hide social activity. then touch on the touchscreen keypad. For more, see вЂњText entryвЂќ on page 23.
вЂњWi-FiВ® networksвЂќ on page 39.
by touching them one at a time. full keypad, touch Device keyboard. on) or down (ringer off). whatвЂ™s been using the most battery. MOTOBLUR (вЂњEdit & delete accountsвЂќ on page 13). way to take the photo. the lower left. Touch the image to open your gallery. to вЂњMemory card & file transferвЂќ on page 42. Touch to see song details. вЂњBluetoothВ® handsfree devicesвЂќ on page 38). phoneвЂ™s memory card with WindowsВ® Media Player. WindowsВ® Media Player (see www.microsoft.com). вЂњMemory card & file transferвЂќ on page 42.
should show in the status bar. XP, Windows Vistaв„ў, and Appleв„ў Macintoshв„ў. home screen, just start typing. вЂњApps & updatesвЂќ on page 11.
in вЂњWi-FiВ® networksвЂќ on page 39.
through your personal web portal at My T-Mobile. navigation system with voice guidance. Follow the prompts to speak or type your destination. For more, go to www.google.com/mobile/navigation. > Privacy > Turn off Latitude. WEP, WPA, or WPA2. Enter a unique password. if they enter the correct password. 2 Touch Save when the settings are complete. in areas that have little or no network coverage. Note: Wi-Fi calling uses calling plan minutes. phone plays a beep and shows warning. the Phone Portal home screen! connection, and choose Memory card access. Input Method > Multi-touch keyboard. Password lock to your phone, for security. email address and MOTOBLUR password. вЂњManage & restore appsвЂќ on page 11.
digital apparatus complies with Canadian ICES-003. also vary in the amount of interference they generate. is the better/higher of the two ratings. Hearing devices may also be measured for immunity to this type of interference. you are to experience interference noise from mobile phones. may restrict the exportation or re-exportation of this product to certain destinations. allows you to subscribe to updates on new products or special promotions. Registration is not required for warranty coverage. of your dated sales receipt to confirm warranty status. unless otherwise provided for below. due to normal wear and tear are excluded from coverage. rated capacity and batteries that leak are covered by this limited warranty. (d) other acts which are not the fault of Motorola, are excluded from coverage. or other peripheral equipment are excluded from coverage. 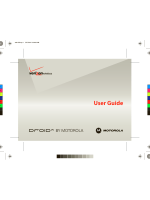 or non-Motorola housings, or parts, are excluded from coverage. applications, please create a back up prior to requesting service. most importantly; (e) your address and telephone number. SOFTWARE TO THE FULL EXTENT THESE DAMAGES MAY BE DISCLAIMED BY LAW. other rights that vary from state to state or from one jurisdiction to another. В© 2010 Motorola Mobility, Inc. All rights reserved.